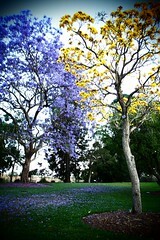 Jacaranda mimosifolia is a sub-tropical tree native to south-central South America that has been widely planted elsewhere because of its attractive and long-lasting pale indigo flowers. 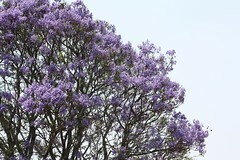 It is also known as jacaranda, blue jacaranda, black poui, or as the fern tree.Older sources call it Jacaranda acutifolia, but it is nowadays more usually classified as Jacaranda mimosifolia. 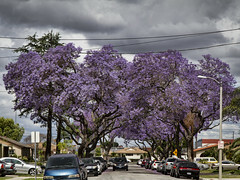 The Jacaranda Tree is a large growing, drought tolerant, shade tree that lights up the landscape with large, vibrant purple blossoms every spring that last for months.